Every Christmas Grandma loves to go prawning. Not only was my step-sister hosting our momentous first Christmas as a blended family, but a summer storm had forced us all inside. Together. Lightning flashed, and with a sonic boom that rattled the ornaments on the tree, the television flickered off. The incessant hum of the air conditioner ceased, and unease swept through the house. “How we supposed to cook without power? I’m not just eating salad,” my brother Marco grumbled, arms folded sullenly across his chest. We gravitated to the dining room, where the entire room sparkled with beautiful handmade decorations. Bethany must have stayed up all night. I grinned at my step-sister and moved two seats along. No one wanted to sit next to Gran when she started slipping prawns into her bag. She still believed we didn’t notice she smelled like a walking ad for cat food every Boxing Day. Bethany hummed a Christmas carol to herself as she brought in a cold platter of deli meats. She was bumped in the hip by a drunk uncle pushing past, and I watched as the tray started to tip, sliding food all over the floor. I cringed and waited for the usual hysterical screaming that signalled our family Christmases. Instead, Bethany just eyed the pile of food curiously. “Rupert!” she finally called out happily. A click-clack of claws scattering over polished floors sounded from the living room, before the family collie nuzzled his head happily into Bethany’s hand, tongue lolling as he panted. “Eat,” Bethany commanded, pointing to the mess. Hands clapping delightedly, she surveyed his frantically wagging tail. “Now we can all have a Merry Christmas! People can have turkey when it’s ready. 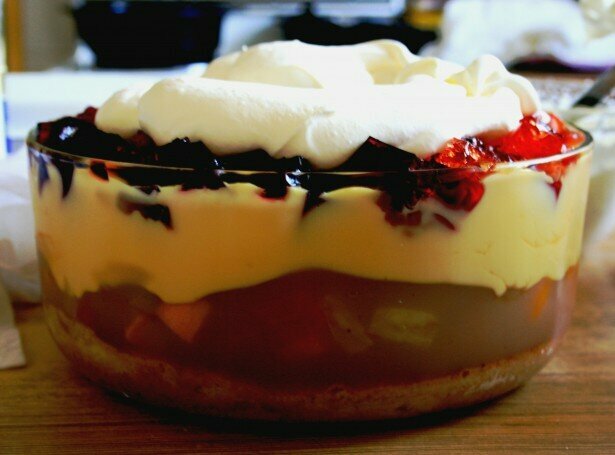 But first, Farah made a trifle.” She grinned wickedly at me and skipped back to the kitchen. Jumping out of my seat, I beat her to the fridge to carry my prized dessert. Bethany grabbed a handful of spoons from the cutlery drawer and some plastic bowls. After dishing up, she hollered for everyone to come eat. The rest of the desserts had trickled their way in, and I had to admit, I was liking the sweets-before-meats variation Bethany had thrown in. “Good work, sis,” I complimented, and she beamed.